Essentially, Zen is the study of the self. The great Master Dogen said: “To study the Buddha Way is to study the self, to study the self is to forget the self, and to forget the self is to be enlightened by the ten thousand things. To be enlightened by the ten thousand things is to recognize the unity of the self and the ten thousand things." We tend to see body, breath, and mind separately, but in Zen they come together as one reality. The best way to achieve a state of Zen is the meditation. It’s a very simple practice. It’s very easy to describe and very easy to follow. One of my ways to meditate is to draw. In this little book I offer you twenty of my meditations focused on Chinese Dragons. 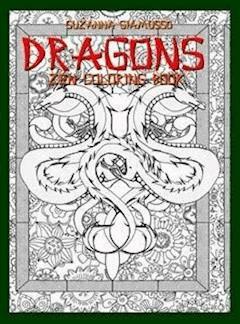 Yours will be the pleasure to color them with your favorite colors. Have fun!